Rtose was commllanIderjl, Greenland Patrol. Div-ision~ at Coast Guard Headquarters. operations inl which it participatedd"
sa vi nI and other service equipment. I111IsualIInut the country on MaI~y 7 and 8. 1 Published wvith the approval of the Director of the Blalget. dress delivered by Lt. Comdr. Guy L.
season of navigation just closed. of America was elected vice chairman. to the Protocol of November 26, 1946.
ment, to become effective July 1, 1948.
ber ~from each, contracting government. domm of Great Britain and Northern Ire. agency related to the United Na~tions. whal:les or (3) six sei whales. safe or good water for nav~ligatfing a ship. untenton.T'his is a matter under the! proval of that agency. It is the practice! prescribing which care would be ta~ken,. of a Iregul~laionl in the Fiedleral Register. break~lille vessels built in other countries. pinlcoment, and 1,(000 shaft horsepower. lines, hull details, and machinery. fully in the harbor cutters. thle heavy storms along the east coast. working on the east coast. ment of thet North nr-inrd-clas; vessels. a part of the weiehlt of the towboat bow. channel wider tha~n the convoyed vessels. resstels durlling the winters of 1!-12-19144. thle Rar~itan class cutters built in 19393.
the high yield strengthi of this material. wre ldji n have been followed on all wRorki. amperes of 440b-volt 60-cycle current. in the Sea of Okhotskr and the Arctic. 5 feet in, thickness at about.4.8 knots. sll-st ice, and drift ice. river cutters and leased river towboats. 8,3p00 horsepower on each. shaft. Meanl~llhn de Campanha Brasil, Most Ex. Order of Mlilitary Merit of Brazil. Centofanti, Enio J., 81e (R). El kardlt, Garnet H., 31411111ee (R). Fr'1itch, Rollin A., 81c (R). Hughes, Charles J., 81c (R). Oneto, Anlthony L, lieutenant (jg). Owenis, T~homas E., 810 (R). Seutter, D11nabll J., SC2c (R). Lawpler, Joseph J., commander (R). Miichel, 'Carl, rear admiral, USPHS. Pine, Ja mes, rear admira~l. Roach, Philip F"., rear admiral. Rose, E~arl G., rear admiral. Salinantll. WCilliam K., rear admiral. Stratton, Dorothy C., captain (WSR). TOwle, W~illiam F., rear admiral. Zeusler, Frederick A., rear admiral. Star in lieu of second). Adams, Robert H-., 81c (R). Britton, Mdack G., ACRMI (CA). II~itadon. Rober't G., S~lik (R). M~erritt, Charles TP., Sic (R). Andrews, Bernardl R., Jr., lieutenant. Banks, George L., SC>lr (in lieu of Navy. of N;IvyJ and Marine Corpns Modull~). Booth, John EP., lieutenant (jg). Frliced, Robert A., BM2c (R). Navy and Mar~line( Corp1)S Medal). H-opper, William D., Jr., W~T10. Johnson(,l. Owen J., lieutenant (jg). Kimballl, Richalrd S., Ba11le (R). Lee, Mlelvin 8., H-A2c (RZ). Mlulhern, Raymnondl K., BM2c (R). MlacDonald, Evenr~t t W., 3103ileI1~ (R). Ne~lson, Engel~ri O. W., Jr., lieutenant. Parker, Rtobert K(., JI1n3~131 (R). Prestidge, James C., ('nMIllIR (R). Rii;.lr, Gordon K., BMI2c (R). Scoles, Robert D., IEMl~e (R). Sias, Howa rdII M., lieutenant commander. Thur11ignI, Gordon P., BMS~~ (R). Allen, Bernard W., ARMlc (R). Blrilh, H-oward J., lieutenant (jg). Boyajian, Edwardt A., AMI~lle (R). Branstrom, Nels A., AMM2c (R). Brackwa~T~ Y, Edward1 D., AMM1~21 (R). Cavic, George.~e AM Alte1 (R). Cromwell, William J., ARM2c (R). Curtis, George~ A., Abl312( (R). Eper~ly, Vinton A., AMMIlc (R). (Gold Star in lieu of second). Fryzel, Edwardl S., Ailt~ll (R(-). Hayea, James C., :R31:'o (R). Kimnball, Richard S., BMlc (R). Lockie, Joyee D., AMM~lc (R). Ma~~llllrkab Ido Walter N., GM2c (R). 31,Gove\crn, Gerald E., lieutenant (jg). N\ovakl, John, I:DI ( (R). Pr'l.l]in~. Allen F., lieutenant (jg). PI!lie.<**, Robert A., AM:Il-'e (R). Us -adlin a. Edwarrnd J., .\MAINI (R) . Rigg:s, Jam~es L., lieutenant (jg). RObP, W~illihDI E., APlc (R). Shebtaniian, Yrege R., CnIL'( (R). St. Onge, Josepht E., A fu12(;. Tromnbley, James E., GIMlc (R). 1Yhite. Gent~~I TY ., AMMlc. ypo gy.I., J4,,,.phl A., nA313f l.
YIoung, Oliver S., AMM~llr . Abbott, S'amuel, Jr., SoM~3c (R). Ackerman. Andrew Gr., Jr., C'cM3 (R). Fick. Edwanrd N., BM2c (Rt). Finch, Jack H., StM2c (R). Fineer, Chanrles E., lieutenant (jg). Fink, Morton M., SoM~c (R). Fogel, John R., Fle (R). F'orrester, Jack E., lieutenant (jg). Fry3e, Lowell B., lieutenant (jg). Galloway, Grady R., lieutenant (jg). Geist, Sidney R., Jr., lieutenant (jg). Geohegan, William. C., Jr., lieutenant. George, Melv;in F., 810 (R). Gielow, F'rancis H. P., GM12c (R). Gradin, Ellis F., lieutenant commander. Grosswceiler, Irvin L., MnllIhll3c (R). Haffert, William A., Jr., Sp(PR)1c (R). Hall, Norman B., lieutenant commander. Hand, Robert F., CSp (PS) (R). Hearn, Gerard A., lieutenant (jg). (Bronze Star in lieu of second). Hedges, K~enneth 31., Sflc (R). Hendlricks, Charles W., S2c (R). Hess, Leon A. T., EJ3110. Hickey, William L., n1-31512l (]R). Hoisington, Richard E., 83130 (R). Hollern, Da~niel F., S803130 (R). Holloman, F'arrol D., Cox (R). H3oward, Robert C., 81c (R). Hunter, Harold A., GM2c (R). Huus, William A., OBM (R). Jackrson. William W., PhM3c (R). JIfferies. Robert F., Cox (R). Jrn nin gs. Glen S.. lieutenant. Jones, Roscoe Nc, Jr., Cox (R). Julius, Williarn D., R~Tec (R). Jumnonville, Fcelix J., lieutenant (jg). Allen, Nelson W., Schite'c (R). Aillen, S. E., lieutenant commander. Arnold, Erlie D., 310313130i (R). Arr in gt on.. Charles B., commander. Beal, Ira A., Jr., CG>I. Bell, Ora L., 81c (R). Box edl~l, Benjamin L., S'1e (R). Brossman, Thomas J., WT3c (R). Burt. Ro~bert F., lieutenant (jg). Carr, Frederick W., lieutenant (jg). Coburn, W'illton~ T., 80lJ313 (R). Colema;n, Eben M., GM~Ic (]R). COmUbs, Edward W.,. III, B312. CI innings;r~. John D., lieutenant (jg). CIr.ve Warren G., B>Hle (R). Daniels, Louis A., S2c (R). DeLamarter, Donald E., Cox (R). Denk, Michael TC., S2c (R). Dixoln. John J., lieutenant commander. Dougflas, Sidney WV., lieutenant (jg). Drisko, Donald A., AM lille. Driscolll, Thomats F., R312r-i (R). Dugan, Clarence L., 81e (R). D~uncan, Albert D., 810 (R). Ellis, Merle D., 82c (R). Elmer, Robert ]E. P., Jr., lieutenant (jg). K~eene, Henry C?., Jr., lieutenant. Kerrigan,~r l Eal~;lw Ird., ]B1M2J. Kingsley, Arthur H., lieutenant (jg). Kostival, Joseph J., S10 (Rt). Krilrn. E'tilde J., licute~nant (jg). Kuriitai. Stanley'? B., lieuteennt (jg). r.Langet-in. EInnllllr ini ., 8$~n1Ii* (i). Larsonll, P'eter F., SWe (R). Lasitineer.l Cinuallol L., 81ce (R). T;Lead, Warnrcn D., lieutenant (jg). Lore~ntzen. Laurence D., SC~ic (R). rLumpllkin. John1 H., lieute~nantt com. JlncI,- lle. Gordon WC., captain. 31urnevitchl Robert R., RIIMS-:c (R). )lin rtin, GeorueL~I A., lieutenant. Miller, Samluel R., C'Jile (R). Miner, F'rank E., lieutenant commanders. Jleft;he. Frankr M., lieutenant com. McIrann, Gerald R., C~Ip (PR) (t). AIS;lelnma I. James C.1 Sic (R). Mc~eil, Donaldl C?., captain (tw7o). Nimsf, GeorI~i I., SC2c (R). O~lson, Car~l R. G., F2c (R). Padtur, Jochnl D:., Cox (R). I'ut rickl, ('lydle F"., Jr., S1e (R ). P'lannerr~ Jolin II., lieutenant (.ig). Quninri, George C., AS (R). RuwsFrthorne Joh~n W., Jr., liC'utenun~llt. nRa yslr..fi, George E.. Jr., lieuteinant (jg). Rob~erts, HeIcnry T., BM~ll (R). Rodgers, Daniel Cr., Alnhl.113cl (]R). IT**Averw.~ H-arold E., (:ox (R). R(ood, Robert E., AIMINI.Sc1( (R). Roseberry, Mlilms.l W., GM13c (Rt). Rioullet, Valerianlo J8., r,312.- (R). Rutk~owski. Edwa~rd J., 511 '0 (RC). Sa;;nders;, H-omer A., Pa'-lue (R). Shanks1;. Leon D., GMIc (Rt). Shively, Bruce E:., lieutenant (jg). Shively, Donatlld E lieutenant (.ig). Smlithl. Panul Y., CDM3 (R~). Solalri, Williaml J., lieutenant (jg). Sper'ber. Nathianiel H.. p~lly. (R). S('II]pl~ill o DavTIid J., gal(1x.l (R). S;tephetnso~n. Robe;r~t Ai. Flc (Rt). Swvinifrski. Henry? F".. 810 (R). Tayllor, Jesse G., (``XI. 'e (R). Thuet, W~illimul H., J~lM10 (R). Tyou;l. Henr'y WV., Jr'., cnsienii. Unann~r. Peter P., cox (R). Vautrain, Charles E., Jr., lieutenant. Vooris, George R., 810 (Ri). Wantkins, Thomzas H3., S'oM2e (R1). WVeeks, W~illiamn A. R., MoMMlRIC (R). Whitehead, Reginald E., 81c (R). Wroodley, Harold 1F., 810 (R). WC~oodwFcard, Miltosn H., CWTT (R). Federal Government, Mr. Adelbert B.
Ilo-adquar;~ ters, retired on January 31.
quarters of the samae service. with the Coast Guard in 1939. Mr.
ity, or to disclose ruling court decisions. were 12 inches in diameter. in. Chief, Allied Forces, Pacific. District Office to Western Area Office. Ingham~ to 1st Coast Guard District. Coast Guar'd District to Aendemcll!.. mander, North Atlantic Ocean Patrol. 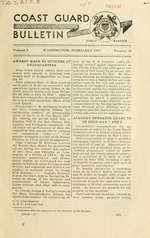 25, D. C., at 45 cents per copy. Coast Guard District to Academy. Gualrd Air Station, Brookrlyn, N, Y.
Owarsco to Storis as executive officer. Lt. Clllindr. Edwardl'~ J. F'leming, USCGIR. Lt. Comdr. Paul E. Clement. L~t. Comdr. Rolla W. Sicafoose. Lt. Comdr. James R. Balderson, USCGR. .t Comr A dant TC. CG pr. Lt. Comndr. Kenneth S. McCann.